Introducing the Design Shack Re-Design! We’ve had a very busy few months behind the scenes at Design Shack, working away on various changes and improvements to the site. First and foremost is a brand new design — it’s cleaner, faster, responsive, and hopefully a much more enjoyable experience for you to use! Second is a host of new features for Design Shack members. These include vastly improved submission of your designs, keyboard navigation, an “Activity Stream”, the ability to save designs to a “Collection”, and your very own profile on the site. We’re really proud of this latest iteration of Design Shack, so read on to find out more about our thinking behind some of the new features! Because Design Shack is so much more than a “design blog”, it’s always a challenge to decide how best to structure the site, prioritise our content, and cut down on clutter. We’ve spent a long time thinking about how best to do this in the latest design, and hopefully it results in a really enjoyable experience for you, our reader! Design Shack is now split clearly into two sections — Articles, and Gallery. Though there are some similarities between these two sections, each has it’s own unique design that best fits the content. The site is fully responsive to work on mobile devices and tablets, giving you a brilliant reading experience without compromising on the information on show (in fact, I think my new favourite way to browse Design Shack is on an iPad!). Everything is retina-ready, and should look great on your high-res display. We’re working on providing retina graphics for all our articles/designs, and this should be in place soon. We’ve also given you more choice in how you browse designs and articles. Flip the layout togggle in either section to see a completely graphical view of our archive, or a more information-packed version. We’re also continuing to build upon the extra features on offer for Design Shack members (it’s free to create an account). You can check out the full range of features at our membership page, but we’d love to tell you about some of them here as well! We’ve made it easier than ever to submit one of your designs to the gallery. Just enter a few details, drop in a large JPEG of your design, and we automatically help you create the thumbnails and graphics required with a smart web interface. It just takes a few seconds to upload a design, and there’s no fiddling required to create various graphics to upload. After uploading a design, you can track its progress through your Design Shack profile. It’s easy to watch it pass through the approval process, through to publishing. As a Design Shack member, you can rate your favourite designs, and save those you’d like to come back to later. Just hit “Save to Collection” when viewing a design, then you can find it any time on your Collections page. All this works wonderfully in conjunction with our new keyboard navigation (use the number keys to rate a design, and “s” to save it to a collection). You can keep track of all your design submissions, ratings, profile notifications, and much more using the Activity Stream. This is always available at the top right of your screen, and it’s a great way to keep track of how people are rating and saving your designs! Every Design Shack member now has their own profile page on the site (here’s mine!). It showcases all the designs you’ve submitted, your bio/social profiles, and your recent activity on the site. It’s worth taking two minutes to update your profile now, so people can find your website, social profiles, and a useful bio when they land on your member page. I really hope you’ll enjoy the new design and functionality that we’ve been working on. We’re committed to making Design Shack a wonderful community for designers, and can’t wait to see some of your awesome new design submissions come rolling in! I’d love any feedback and suggestions you have on the new site design, or requests for new features you think we should be adding. 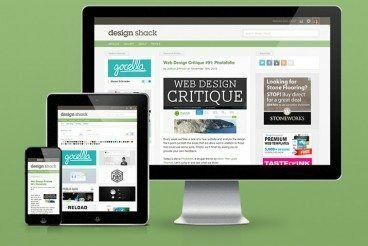 Have fun with the all-new Design Shack!